Last night's awards dinner brought a large crowd of parents, volunteers and fans as the Rebels celebrated their most successful season since the mid '90s. From here, it's on to the off-season for the Rebels. I'd imagine the out-of-town players will be on their way home over the next few days. For those players not returning next season, it's been fun watching you play over the course of this season, and I wish all of you the best of luck in whatever life brings you, both on the ice and off it. For the group who will make up the core of the 2011-12 Rebels, all the best during the off-season, and hope to see you all again come training camp in late August. Tip of the Hat: I thought it a nice touch that Rebels brass gave each player their white home jersey from this season prior to the awards being handed out. Reading between the lines, the team will be donning new silks next season, stay tuned over the summer for more info. Cyclone Taylor Cup: All the fun from Fernie gets underway today, with Osoyoos, Fernie, Richmond and Peninsula getting set to duke it out. I can't promise anything more than the odd Twitter update for this event, as I'm planning to take a few weeks away from the blog unless something major happens, but our friends in Fernie will have all the info you need at RiderNews. The disappointment of the KIJHL finals will still linger for a while, but tonight Castlegar can focus on the positives of a remarkable season when the team hands out their individual awards. The Rebels set a franchise record with 42 victories this season and advanced to their first league championship series in 15 years. I've been told the attendance figure of 1,110 for Saturday's Game 6 was the highest total since the 1980s, which if true is incredible. Tonight, though, it's all about the players, several of whom won't be returning to Castlegar next season (and for good reason). Ryan Aynsley is off to Northern Michigan, while Anthony DeLong will skate at Central Oklahoma next fall. I wouldn't be at all surprised to see more college commitments come down the line soon. Overagers Darren Tarasoff, Mike Wiest and Erik Wentzel will also move on after lengthy junior careers (both Tarasoff and Wentzel spent time in the BCHL and SJHL respectively before returning to Castlegar while Wiest was acquired from Fernie midway through the season). All four twenty year-olds were great leaders this season. Unfortunately for Wiest, injuries hampered his time during the playoffs, but when healthy, the Albertan was a rock on the blueline. Even though he wasn't expected to return during the post-season, Wiest stayed in town and remained as integral a part of the team as possible. Tarasoff logged tons of minutes on the back end all season (especially during the finals when the Rebels had only 5 regular blue-liners in the lineup for much of the series), and was a great mentor to Castlegar's younger blue-liners. Never the loudest player on the ice, Tarasoff is a smooth skater who should definitely get a look at the college level (in my opinion), be it in Canada or the United States. Up front, Aynsley was a different player after returning from his stint in Trail. He logged more minutes on the PK, and was a more ferocious fore-checker which will come in handy during his next four years as a Wildcat. Wentzel caught my attention right from camp, mainly because he hit everything that moved. Not only that, the Kelowna product put the puck in the net too, notching one hat-trick this season against the Nelson Leafs. He provided plenty of grit to Castlegar's forward ranks and was a quality leader off the ice as well. DeLong, who still has one year of junior eligibility left, will do well in Oklahoma City. Like Wentzel, Tarasoff and Aynsley, he had Junior A experience (and was a teammate of Tarasoff's with Williams Lake last year), but came to Castlegar to bolster the offense. DeLong played a lot of the year on a line with Stuart Walton and Tyler Robinson, and his net-crashing style and finesse complemented Walton's passing ability and Robinson's grit tremendously. Jon Zacks reported earlier this week that Jesse Knowler has committed to Trail (BCHL) for next season. The newly-minted 17 year-old scored 8 goals during the playoffs, finishing 5th in team scoring during the post-season. I'd be surprised if more Rebels weren't able to crack Junior A rosters next year as well. Stay tuned to the blog for a full recap of tonight's awards dinner, I'll try to wrangle up some tape from Aynsley, Wentzel, Tarasoff and head coach Steve Junker that Jonny put together for his Overtime show earlier this week, in case you missed it. A tough way to end the season, to be sure, but the Rebels can hold their heads high knowing tonight's 7-1 loss was in no way indicative of the way this series was played. 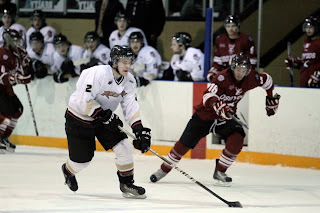 Shane Hanna scored twice, and Steve Sasyniuk, Thierry Martine, Brock Anderson, Curtis Kort and Mark Miller added singles as the Osoyoos Coyotes became the fourth KIJHL expansion team to win a championship in their inaugural season (following the 1977 Rebels, 1994 North Okanagan Kings, and 1995 Sicamous Eagles). Arthur Andrews had the lone reply for Castlegar. In all, it was somewhat of an odd end to what had been a terrific series, but most of the 1,100+ in attendance (including a contingent of Coyotes fans) stuck around to see the KIJHL hardware awarded. Congratulations to the Coyotes, you are a strong bunch from goaltender Kyle Laslo on out, and are worthy champions. I trust both Osoyoos and Fernie will represent the KIJHL well at next weekend's Cyclone Taylor Cup in the Elk Valley. I'll have a more comprehensive look-back at both the series and the season as a whole next week, until then, thanks Rebels for a thoroughly entertaining season, it's been a privilege to watch this team on what has been a memorable run for everyone. It's do or die time for the Rebels. After last night's 4-2 setback, Castlegar faces elimination for the first time in these playoffs, and needs a home-ice victory (in front of what's sure to be another boisterous crowd at the Complex) to force a seventh and deciding game Monday night in the South Okanagan. The Good: The Rebels have won 6 straight games on home ice, and the only setback at the Complex during the 2011 playoffs was a wild 7-6 loss to Beaver Valley in Game 2 of the Neil Murdoch final. The two victories in Games 3 and 4 may well have been the best performances of the playoffs. The Bad: It looked like the team really missed captain Taylor Anderson last night. The persistent forecheck and crash-and-bang style of play wasn't there in Game 5 to the degree that we saw it in Games 3 and 4. Anderson's absence meant Erik Wentzel switched lines to play with Anthony DeLong and Stuart Walton in a trio that generated one goal and several quality scoring chances. The Ugly: To take this series, the Rebels will need to win on the road. Castlegar has now lost their last 5 games away from the Complex. The Coyotes meanwhile, played (I thought) their strongest game of the series, hurrying Castlegar's defence (particularly in the first two periods) and forcing defensive-zone turnovers. Alex Ross's terrific series continues though, a leather-flashing larceny of Thierry Martine on a second-period breakaway serving as the exclamation point on a 34-save evening. It's the final home game of the season tonight, no matter what happens. It's a pretty safe bet though, that the Rebels won't go down without a dogfight. Broadcast Info: We'll have our final webcast of the 2010-11 season tonight beginning at 7:30, while our friends from Osoyoos, Randy Bedard and Tom Shields have the radio call on EZ Rock Osoyoos and the Coyotes' website. Fun Fact: If my stats are correct (and by that I mean the KIJHL site), the Coyotes could become the fourth expansion team to win the league title if they take this series (joining the 1994-95 Sicamous Eagles and 1993-94 North Okanagan Kings). The first team to do it though? The 1976-77 Castlegar Rebels. The unlikeliest of heroes tonight for the Coyotes, as Matt Guerts rifled home a wrist shot on a solo effort just under 7 minutes into the third period. The 20 year-old beat a sprawling defenseman and lifted the puck over the shoulder of Alex Ross to break a 2-2 tie. Josh Gray, Thierry Martine and Brock Anderson also tallied for the winners, while Anthony DeLong and Diego Bartlett replied for Castlegar. Ross made 34 saves in a losing cause, while Kyle Laslo stopped 26 of 28 Rebel shots including a late DeLong breakaway. To me, Game 5 was the best game Osoyoos has played in the finals, which is noteworthy considering the fact they were missing Taylor House, Jake Newton, Stefan Jensen (injuries) and Corey Allen (suspension). The Coyotes were able to put together their largest shot margin of the series, and frustrated Castlegar in their own zone, particularly in the first 40 minutes. Castlegar's Taylor Anderson was a late scratch for the visitors, with Kwinn Mazzilli seeing his first action of the finals on the Rebels' fourth line. So there you have it, the backs are now up against the wall. Tomorrow's Game 6, which was always going to be the last home game of the season, is no longer a championship clincher but rather a fight for survival. The Complex has been kind to the Rebels, with only one of the team's seven playoff losses taking place there. The louder, the busier, the better. Obvious statement of the day: this one is big. Erik Wentzel and the Rebels (photo credit: Robson Fletcher, Castlegar News/Facebook) asserted their physical selves again on home ice Tuesday and Wednesday, and are all smiles heading back to the South Okanagan for tonight's Game 5. Wentzel's cheeky dump-in led to linemate Taylor Anderson's check on Shane Hanna in the corner late in period two of Game 4, which in turn caused a turnover that wound up behind Kyle Laslo for the 2-0 goal. Neither team has had much time and space all series long, but the Rebels were the better team at eliminating the opposition's chances on home ice, and it can be argued that the same occurred at times in Osoyoos last weekend. What else can be said about Jesse Knowler? Two more goals (8 in these playoffs) for a guy who only turned 17 last week. Watch for his line with Ryan Aynsley and Spencer Brodt to be dangerous yet again. Take everything said about Knowler, and wash, rinse, repeat for Hanna. The '94-born d-man is another who definitely won't be playing in the KIJHL next season, and the likes of him, Ross Mancuso, Matt Guerts and Mark Miller have been minute-munchers on the back end for Osoyoos. Aside from flurries of action around Alex Ross, the Rebels kept a pretty clean house in their own zone. The question is though, will that carry over into what's sure to be a heated environment at the SunBowl Arena. A third straight win would give Castlegar the opportunity to close out the KIJHL on home ice Saturday, but a Coyotes victory would mean home ice could be a trump card in the Rebels' attempt to stave off elimination. Broadcast Info: Our friends from the Coyotes have the webcast tonight, beginning at 7:35, while Mountain FM's Jon Zacks hits the air at 7:20 PM for his pre-game show. Minor Details: Castlegar's pee-wee reps will battle the Burnaby Winter Club for third place this morning at the Tier III provincials in Campbell River. The Rebels dropped a 6-4 semi-final decision to Elk Valley in last night's semi. Meanwhile the Kootenay Wildcats female AAA midget club opens up a best-of-three championship series today in Kelowna. Best of luck to both teams! Another outstanding home-ice performance by the Rebels has evened the KIJHL finals at 2 games apiece. Jesse Knowler scored the game-winner early in the second period, when he stripped an Osoyoos defenseman at the blue line and fired a shot through the legs of goaltender Kyle Laslo. Taylor Anderson added a second-period tally after he created a turnover in the Osoyoos zone as well. The Rebels outhit, outscored and frustrated their opponents for the second straight night on home ice, and set up a pivotal Game 5 Friday night at the SunBowl Arena. It was a quiet night at times for Alex Ross, but the 19 year-old stopped everything that came his way for his first shutout of the playoffs. The line of Anderson, Tyler Robinson and Erik Wentzel seemed to be the largest thorn in the side of the 'Yotes, as they hit everyone, everywhere and created a few quality scoring chances. And while there weren't as many penalties issued tonight as in previous games, the unit of Jamie Vlanich, Stuart Walton, Erik Alden and Corbin Legros was outstanding, especially during a first-period kill that saw them hemmed in their own zone for more than two minutes. To call either tonight's game or yesterday's Game 3 lopsided would be unfair, but it's clear the Rebels had a little bit extra in their tanks with close to 800 screaming fans behind them. Whether the momentum can carry on into Friday's Game 5 remains to be seen, but it seems as though 45 hours is much to long to have to wait to find out. 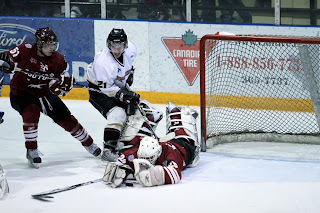 Expect another tight game tonight as the Rebels and Coyotes drop the puck on Game 4 of the KIJHL final (7:30, Complex). It's a golden opportunity for Castlegar to even the series on home ice, in front of what's expected to be another large crowd. But to do that, the Rebels will need to maintain the physical play that's carried them through the first three games of the series, and limit the Coyotes' time and space. The series so far has come down to bounces and timely goals, but last night's 30-17 shot advantage (including 13-2 in the opening period) was the largest disparity we've seen thus far. Osoyoos is dangerous, though, with the likes of Thierry Martine, Steve Sasyniuk and Stefan Jensen always waiting for a long pass to catch the opposing defencemen sleeping. Fun Fact: Ryan Aynsley's game-winner was the first even-strength goal scored by the Rebels in this series. Broadcast Info: We'll have the webcast yet again beginning at 7:30, while Randy Bedard and Tom Shields have the Coyotes' radio call on EZ Rock Osoyoos. Post-Game Tape: Jon Zacks and I caught up with a couple of Rebels after Game 3. For his chat with Aynsley, click here. For our conversation with Alex Ross, click here. Thanks to Kim Magi from the Castlegar News for the pic. Ryan Aynsley's under there somewhere. The 20 year-old from Kelowna scored 1:39 into overtime to lift the Rebels back into the KIJHL final with a 2-1 victory over the Osoyoos Coyotes. Aynsley took a centring feed from Spencer Brodt and fired a one-timer past Coyotes netminder Kyle Laslo for his team-leading fifteenth goal of the playoffs, and Castlegar's 3rd OT winner of the post-season to boot. But just like Games 1 and 2, tonight's contest was a nail-biter. Jesse Knowler opened the scoring 8:03 into the first period on a pretty cross-crease pass from Aynsley in a period that saw Castlegar outshoot their South Okanagan opponents 13-2. The Coyotes waited until the 6-minute mark of the third period when Steve Sasyniuk pounced on a rebound and put it past Alex Ross. It was a fitting reward for the line of Sasyniuk, Josh Gray and Van Bettauer, after Gray was robbed by Ross late in the second period. Tonight's game was no less physical than the weekend tilts in Osoyoos. 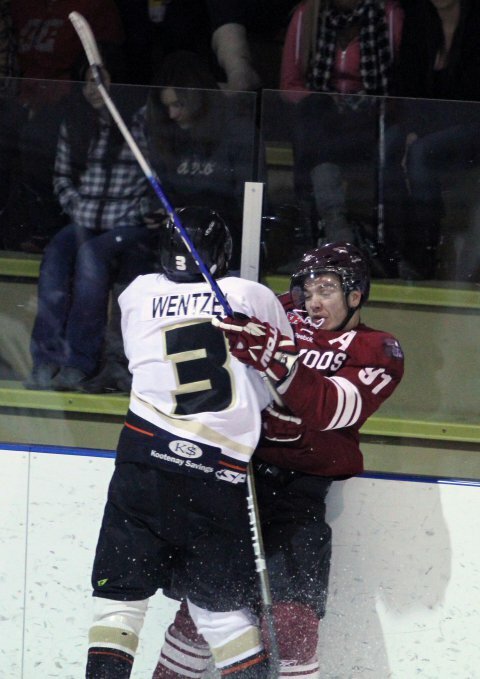 Rebels d-man Ryan Reid's punishing blow on Coyotes forward Sam Nigg was the exclamation point on another high-tempo performance, and sets up a crucial Game 4 tomorrow night at the Complex (7:30 PM, kijhl.ca & EZ Rock Osoyoos). Tip of the Hat: To the 786 fans who turned up tonight, it was rockin' in the Complex and a great sight to see. Tip of the Hat, Part II: To EZ Rock's broadcast crew of Randy Bedard and Tom Shields, thanks for having me on during the second intermission. A pleasure chatting with you both! Out of Town: The Richmond Sockeyes have booked their ticket to Fernie for the Cyclone Taylor Cup, after sweeping Abbotsford in the PIJHL final. The Sockeyes won the whole kitandcaboodle in 2009. Back to the friendly confines of the Complex after a weekend that can best be described with the old adage "close, but no cigar." The Rebels and Coyotes play Games 3 and 4 of the KIJHL finals tonight and tomorrow (both 7:30 starts), and for the home side, the message is simple. Win. A Coyotes victory would give them a stranglehold on the best-of-seven series, while the Rebels could force a Game 5 at the SunBowl Arena Friday with a victory tonight. It's also safe to assume that the physical play we saw over the weekend will continue. The Rebels' physical edge not only takes away time and space, but as the series goes on repeated crashing and banging could wear down the Coyotes, especially if Castlegar is to hold serve on home ice. That said, Osoyoos is deadly up front with plenty of speedy forwards who can put the puck in the net with regularity. Another battle to watch is that between Kyle Laslo and Alex Ross. Save two costly goals, these two have matched each other save for save, and the key tonight (on both sides) will be to prevent either 'tender from seeing the puck, and if there are a slough of power-plays like in Games 1 and 2, forcing each goaltender to move laterally to stop pucks. Broadcast Info: As always, we'll have the webcast this evening beginning at 7:30, though work duties will force me to call up a back-up camera operator. EZ Rock Osoyoos will have the Coyotes' radio coverage tonight and tomorrow. Video Evidence: Osoyoos does a great job multimedia-wise, as I've said here before, and their video highlights are something I'm hoping to emulate next season. Check out the tape from Game 1 and Game 2. Out of Town: For the second straight year, the Peninsula Panthers will represent the VIJHL in the Cyclone Taylor Cup. This after a wild 7-game series victory against Victoria in a series the Cougars led 3-0. Richmond can win the PIJHL championship tonight with a victory against the Abbotsford Pilots. Bits & Bites: Castlegar's pee-wee reps are 1-1 at their Tier III provincial tourney in Campbell River. They opened up with a 4-1 win over Victoria Sunday before dropping a 6-5 decision yesterday against Kelowna. They face Corbin Legros' home town of Terrace this morning. For a full list of games involving all West Kootenay minor hockey teams at their respective provincial championships, head to bchockey.net. Grand Forks' new president had some strong words on Mountain FM yesterday, but are they words of change? Michael Wirischagin told our Jon Zacks that "as of late, and for quite some time, the Grand Forks Border Bruins really weren't worth the $7 people were forking out." Wirischagin, a city councillor who also calls the Bruins' webcasts, is passionate to say the least, and I'm definitely interested to see what kind of changes (to both the on and off-ice product) he has in store, including a new head coach and GM, who could be named as soon as next month. Corey Allen broke a 2-2 tie in the opening minute of the third period, and the Coyotes withstood more late pressure to hold serve on home ice. The Rebels had enjoyed two leads, the first off a Spencer Brodt wrister 54 seconds in, the second on a nice cross-ice finish by Taylor Anderson in the middle frame. Thierry Martine and Steve Sasyniuk replied for the Coyotes, the latter on one of three Osoyoos breakaways, two of which were stopped by Alex Ross. Ross made 26 saves between the pipes for Castlegar, while Kyle Laslo stopped 23 shots. Josh McGladery and Brock Anderson took part in a spirited third-period scrap too. The 18 year-old from Vancouver landed a few punches before Anderson got the takedown. Again, a fairly even game, and it will be interesting to see how the series shift to the West Kootenay will affect the finals. Games 3 and 4 are Tuesday and Wednesday night at the Complex, and as has been the case lately, large crowds are expected on both nights. Hope to see you there! The Rebels now know what to expect from the Coyotes after a hard-fought Game 1 that was in the balance until the final whistle. CJ Kort's second-period goal served as the game-winner, but anyone watching last night's game would be hard-pressed to suggest either team had a noticeable advantage. For Castlegar, it shows they can tangle with a team after their only prior experience with the 'Yotes was a 7-3 loss in November on the eve of a major roster shakeup. Tonight, the Rebels need to carry over the physical play from Game 1, though both teams laid out some thunderous checks last night. Coach Steve Junker has told me repeatedly throughout the season that he wants his players to have an edge, although tonight I'd suggest keeping that edge on the right side of the law (after two Rebels were tossed for checks from behind last night) will be a topic of pre-game conversation. Broadcast Info: Jon Zacks will have the call on Mountain FM, while the Coyote webcast crew has your video feed, beginning at 7:35. Tip of the Hat: to the dozens of parents and fans who've descended on the South Okanagan this weekend from all parts of the province. Great to see (and hear)! An exciting first game of the KIJHL finals here in Osoyoos saw the Coyotes sneak away a 2-1 victory in front of a franchise-high 675 fans at SunBowl Arena. CJ Kort scored the eventual game-winner, against the run of play, midway through the second period. Stefan Jensen's first-period deflection was the only other Osoyoos goal, while Stuart Walton replied for the Rebels. Both goaltenders played very well tonight: Kyle Laslo made 25 saves and was named the game's third star, while Alex Ross stopped 23 shots and was the second star of the night. I hope those of you who tuned in on Mountain FM enjoyed the game tonight, it was fun to appear as an intermission guest and Jonny and I will likely do another bit at some point tomorrow. Despite the malaise of Blackberry keyboards, stay tuned for your usual gameday package tomorrow morning. This is shaping up to be a KIJHL finals to remember! The 2011 KIJHL finals start tonight in the Desert, as the high-flying, expansion Osoyoos Coyotes welcome the Rebels to Sun Bowl Arena for a pair of games this weekend. It's the Rebels' first trip to the championship series since 1996. The club, which has been in the KIJHL since 1976 (save a 2-year RMJHL hiatus in the late '90s), has just three championships to their credit, the most recent coming over Sicamous 15 years ago. The Coyotes, meanwhile, have been a favourite to come out of the Okanagan Conference since these two clubs last met in late November. The 'Yotes lost only twice in regulation time all season and posted the league's best record. How They Got Here: The Rebels posted 5-game series wins over the Spokane Braves and Beaver Valley Nitehawks before dispatching the Cyclone Taylor Cup host Fernie Ghostriders in 6 games in the Kootenay Conference final. Osoyoos swept both Penticton and Kelowna before winning the Okanagan Conference final in 6 games against the Revelstoke Grizzlies. Last Meeting: The two teams have only met once, a 7-3 Coyotes home win on November 26, 2010. 16 year-old Carter Rigby, who has spent the playoffs with the BCHL's Penticton Vees, scored a hat-trick while Ryan Aynsley chipped in a pair for Castlegar. Our Opponent: What's not to like about the Coyotes. 2 regulation-time losses all season, the league's #3 and #4 scorers in Thierry Martine and Stefan Jensen, top goaltender Kyle Laslo, top coach Ken Law, top rookie Shane Hanna, and a strong supporting cast make Osoyoos the cream of the Okanagan Conference crop. Martine continues to lead the way this post-season with 21 points, while 18 year-old centreman Taylor House and Colorado import C.J. Kort are in a two-way tie for second with 14 points each. 16 year-old Hanna is arguably the top '94-born d-man in the league (though Kelowna's Turner Lawson, Kimberley's Bryce Perpelitz and Fernie's Kade Pilton all deserve a mention as well). Laslo has a positively Fort Knox-like 1.60 GAA and .940 save percentage in the playoffs to go along with his 7 regular-season shutouts. Broadcast Info: Jon Zacks has the call on Mountain FM for those of you in the West Kootenay (listen online here too). Osoyoos' crew has the webcast call beginning at 7:35 PM. Out of League Update: The VIJHL finals between Victoria and Peninsula will go to a seventh game tomorrow afternoon. The Cougars led the Panthers 3-1 in the series before Peninsula clawed their way back. Game 1 of the PIJHL finals went the Richmond Sockeyes' way last night. They defeated the Abbotsford Pilots 3-1. Bits & Bites: Beaver Valley's Dallas Calvin has been practising with the WHL's Kamloops Blazers this week. This after he signed with the club, who was eliminated from playoff contention last night (for only the second time in the franchise's 30-year history according to Gregg Drinnan's Taking Note. Grand Forks has tabbed play-by-play man and city councillor Michael Wirischagin as their new president. He takes over from Jason Odland. The Bruins will continue to accept applications for their vacant head-coaching position until the end of the month. The schedule for the 2011 KIJHL finals has been released. On to the KIJHL finals! Ryan Aynsley scored twice, including the game-winner on a 5-on-3 as Castlegar claimed the Kootenay Conference crown with a 5-2 victory over the Fernie Ghostriders. Tyler Robinson opened the scoring on the power-play just over 5 minutes into the first period before Johnny Park brought Fernie level on a Ghostriders man-advantage. Aynsley took centre-stage after Spencer Brodt and Michael Anderson traded second-period tallies, Anderson's a short-handed marker to boot. The Kelowna sniper put two similar shots past Fernie goaltender Andrew Walton, as the Rebels used power-plays to their advantage, capitalizing four times. Erik Wentzel added an insurance marker 12 seconds into the third period, as Castlegar claimed their first Kootenay Conference title since 1996. Man-advantage opportunities were a determining factor to me tonight. Fernie didn't have many opportunities on the power-play, going 1/3, while the Rebels went 4/8 (only Wentzel's goal was scored at even-strength). At times, Castlegar even put five forwards out on the power-play (though Josh McGladery took a regular shift on the blue line tonight). At five-on-five though, there wasn't much difference between the two teams, and Fernie had much of the possession in the first period before the Rebels started asserting themselves in the final 40 minutes. Tip of the Hat: Tonight's attendance: 790. Thanks to each and every one of you, and hope to see you back in the finals! Tip of the Hat, Part II: To the Fernie Ghostriders, who made every minute of this series a battle. They will be a rested, hungry bunch come Cyclone Taylor Cup time later this month. The likes of Thomas Abenante, Cale Wright and Jeff Zmurchyk will be tough for any club to go up against, especially at the Fernie Memorial Arena. Up Next: The Osoyoos Coyotes. Game 1 of the Kootenay Conference final goes Saturday night at the Sun Bowl Arena. Stay tuned for plenty of setup coverage in advance of the series opener. Another short entry, as there isn't much to report. The Rebels will try for another series-clinching victory tonight in their own building against a Ghostriders team that was granted new life last night. Game 5 didn't go exactly according to plan, as the Rebels again found themselves in a first-period hole en route to a 4-2 setback. Fernie will be without forward Connor Morgan tonight. He's been suspended one game for a checking from behind major incurred in the third period last night. Rebels lineup changes (if any) will as usual be made public just prior to game time. Broadcast Info: We'll have the webcast as usual at 7:30 Pacific Time. Fernie's 99.1 The Drive will also provide a radio broadcast. A short recap since I wasn't able to watch the game tonight (though Trail city council did look smashing in their 1961 Team Canada jerseys!). Connor Morgan might end up being the story of Game 5 in more ways than one. The Ghostrider forward scored the eventual game-winner with 1:29 remaining in the second period as Fernie doubled up Castlegar 4-2. What remains to be seen is whether his checking from behind major on Tyler Jones will warrant any extra discipline, historically such fouls have been good for a one-game suspension, but since I didn't see the hit, I'll leave the guesswork to those in charge. Another 3-point night for Thomas Abenante, who continues to be dynamite in the playoffs for Fernie. Luke Richardson and Josh Garneau also tallied for the home side, while Taylor Anderson and Aaron Brewer (according to Jon Zacks) replied for the Rebels. Up Next: Castlegar will get another opportunity to close out the Ghostriders tomorrow night at the Complex in Game 6 (7:30 PT). The Rebels are 2-0 in home fixtures in which they can close out the opposition in these playoffs, we'll see if that statistic holds true tomorrow. Do or die (sort of) for Fernie. Game 5 goes this evening at the Memorial Arena (6:30 PT) as the 'Riders will now look to overcome a 3-1 series deficit. This after 5-3 and 3-1 victories by the Rebels over the weekend in Games 3 and 4 put Castlegar within a win of their first KIJHL final in 15 years. Fernie has been strong at home all season, with only two losses to their credit during the regular campaign (one of which came at the hands of the Rebels). I'm sure the players are hoping for a loud, boisterous turnout tonight to spur the home side on. I'd guess the Rebels, on the other hand, would want to finish this series off tonight. A Ghostrider win this evening would let them back into the series and force a Game 6 at the Complex Tuesday. Broadcast Info: Mountain FM's Jon Zacks has the call live beginning with the pre-game show at 6:15 Pacific. As always, the home side will cover webcast duties. I can't promise any timely Twitter updates tonight as I'll be in Trail covering an event for the newsroom, but the RiderNews feed does a pretty good job of keeping the Twitter-verse up to date. Out of Town: We now know the winner of the Kootenay Conference final will face the Osoyoos Coyotes. This after they eliminated Revelstoke last night in Game 6 of the Okanagan final by a score of 4-2. The 'Yotes will have home-ice advantage for the KIJHL finals, dates and times are yet to be determined. One win away from the finals. The Rebels pounced on a bus-weary Fernie club in the first period and hung on for a 3-1 victory in Game 4 tonight. Ryan Aynsley opened the scoring, converting on a 5-on-3 one-time pass from Jesse Knowler just over 12 minutes in, before Diego Bartlett outwaited 'Riders goaltender Andrew Walton to give Castlegar a 2-0 edge through 20 minutes. Fernie's Luke Richardson brought his club back to within one in the second, but the 'Riders were unable to convert on a number of power-plays, going 1/8 on the night including a lengthy 5-on-3 to start the third period. Spencer Brodt capped off the win with an empty-net goal in the final minute. Fernie had numerous chances, both with the man-advantage and at even strength, to tie the game, but Rebels goaltender Alex Ross had maybe his best game of the post-season so far, stoning the visitors including a late breakaway from Thomas Abenante. Walton was strong for Fernie too, he couldn't be faulted on either goal and made several key saves of his own, including a couple on his younger brother. With a victory Monday, Castlegar would advance to their first KIJHL finals since 1996, when they defeated the Sicamous Eagles. Fernie, despite having an automatic entry into the Cyclone Taylor Cup, have said all season long that their goal is to enter the tournament through the front door. Expect Will Verner's squad to come out guns a'blazing Monday. I'm sure the 'Riders will also be quite pleased to rest in their own beds tonight after a harrowing travel experience. Avalanche control work on Highway 3 between Salmo and Creston forced Fernie to reach the West Kootenay via the Kootenay Lake ferry. And after missing the 5:20 sailing, the 'Riders and Rebels were on the verge of post-poning the game until Sunday until the visitors were able to climb aboard a later boat and scamper down Highway 3A to the Complex. As a result, tonight's opening faceoff was at 9:37 PM local time, 2 hours and 7 minutes later than expected. It's no wonder Walton, Abenante and Scott Morisseau all had strong games: they all stayed with family in Castlegar and Trail between Games 3 and 4. Up Next: Fernie has their backs to the wall (at least in terms of the KIJHL playoffs). Game 5 goes Monday night at 7:30 MT (6:30 Pacific) in a matchup you can catch on the web or on Mountain FM. Out of Town: Osoyoos doubled up Revelstoke 4-2 tonight to take a 3-2 series lead in the Okanagan final. Due to a highway closure and a missed ferry connection on the part of the Fernie Ghostriders, the start time tonight's game between the Rebels and Ghostriders has been delayed until 9:30 PM Pacific Time. We will have your usual webcast feed up on the KIJHL website at 9:00 PM Pacific Time in case the game starts sooner, though the Ghostriders are not expected to arrive in Castlegar before that time. Let's not mince words, tonight's game could make or break the Kootenay Conference final. After a hotly-contested Game Three that featured a call that could well be debated until the year 2111, the Rebels and Ghostriders get back to work tonight in front of what's anticipated to be another large crowd at the Complex. "Walton-gate" aside, Thursday's Game 3 was the most evenly-matched game of the series. Both teams controlled the play at times, Castlegar was able to surmount a two-goal deficit, and even though the Ghostriders left the West Kootenay with a sour taste in their mouths, you know they'll be back with a vengeance this evening. For Castlegar, though, the message is simple. A win tonight would give the Rebels the chance to close out the series Monday night. A loss would breathe new life into Fernie and send the series back to the Elk Valley all square at 2-2. Broadcast Info: As always, we'll have the webcast at 7:30 Pacific time. You can also catch this one on 99.1 The Drive in Fernie. Goal Or No Goal? I think everyone can agree on one thing, and that's the fact that video replay would have solved everything. Pointing to evidence like the referee's position, Stuart Walton's delayed celebration or the placement of the puck on the ice after the shot is unfortunately moot now. It's unfortunate the game had to be decided on that particular play, but at this point I think it would do the 'Riders more harm than good to dwell on it. I don't blame the Rebels players for celebrating once a goal had been signaled, and I also think the referee is an easy scapegoat, as far away as he was from the play. Could he have made a mistake? Absolutely. Did the 'Riders have every right to be upset? Absolutely, I hearken back to a called goal in Nelson earlier this season that (despite lacking the inherent playoff atmosphere) had the Rebels players and coaches just as infuriated. But the best thing to do now (for both teams) is to move on, and focus on tonight's Game 4. Out of Town: Revelstoke and Osoyoos play Game 5 of the Okanagan final tonight in the Desert, it's all square at 2 games apiece. Coaching Carousel: Word came out yesterday that Columbia Valley has parted ways with bench boss Rob Rice, read more here. Princeton's Twitter is reporting that head coach Dale Hladun is also on the verge of signing a multi-year extension. Well if that doesn't provide some water cooler discussion, I don't know what will. Stuart Walton scored a controversial goal with 1:28 remaining to lift the Rebels past the Fernie Ghostriders 5-3 in the most even game of the series so far. Walton, cutting down the right wing, took a high wrist shot that his older brother Andrew Walton appeared to catch with his blocker before it snuck in under the bar. Referee Mike Page signaled a goal, and despite protests from just about everyone on the 'Riders bench (and on the ice), and a lengthy discussion among striped mates, the goal stood. For the record, Stuart was adamant the puck went in during his post-game interview, I'll post the audio once it's aired on Mountain FM tomorrow morning. Again, the Rebels were struck by a slow start, as Fernie defenceman Jeff Zmurchyk snuck home a point shot 1:59 into the opening frame. Anthony DeLong and Luke Richardson traded pretty goals to make the score 2-1 Fernie through 20 minutes. After Connor McLaughlin gave the visitors a 3-1 edge, Castlegar got late second period goals from Jesse Knowler and Ryan Aynsley (the latter coming with only 18 seconds remaining in the frame) to even the score at 3-3 after two periods. That set up the stage for Walton's winner, which as you can see below, is inconclusive, even when broken down frame-by-frame. A huge win for the Rebels, but time will tell if Fernie will use the injustice as motivation for Game 4. All things settled, it should be a terrific tilt Saturday night at the Complex. Up Next: As mentioned above, Game Four will be Saturday night at the Complex, a 7:30 Pacific time start. Out of Town: The Okanagan final is all square at 2 games apiece after Revelstoke beat Osoyoos 2-1 in overtime tonight. Satellite Debris: I had it mentioned to me that the webcast was malfunctioning tonight. After taking a look it appears as though my machine was having trouble re-connecting with our broadcast server. Unlike an issue earlier this year, it doesn't appear to have been an internet issue on our end. I apologize for any difficulties endured by viewers tonight, I'm sure everything will be resolved in advance of Game Four. With home-ice advantage firmly in their grasp, the Rebels entertain Fernie tonight for Game 3 (7:00 Pacific, Complex). After exploding for 8 goals in Game 1, Castlegar mustered only a pair of short-handed markers in a 5-2 Game 2 loss Tuesday night, a game in which penalties and a slow start were their undoing. Tonight's game also marks the first game back in Castlegar for Andrew Walton after the blockbuster trade that saw him head east. I'd imagine there will be a fair amount of support in the stands for forward Scott Morisseau as well, as he makes only his second trip back to his home-town as a Ghostrider after formerly lighting the lamp for Beaver Valley. Trail's Thomas Abenante will surely draw back in to the lineup now that his suspension has been served. Watch for him to replace one of 16 year-old Stefan Burzan or 19 year-old agitator Zach Baba. Broadcast Info: We'll have the webcast this evening at 7:00 Pacific (for fans in Castlegar, note the earlier-than-usual start time). Fernie usually broadcasts away games on the radio, RiderNews has the link and will have the up-to-date info if in fact this is the case. Out of Town: Osoyoos could take a 3-1 series lead in the Okanagan final with a victory in Revelstoke tonight. Mark Miller's power-play goal propelled the 'Yotes to a 2-1 win in last night's Game 3. Trade Winds: In the BCHL, at least. Former Spokane Braves forward Dylan Tappe has been traded by the Trail Smoke Eaters to the Prince George Spruce Kings. Tappe had 17 points with the Smokies this season, after spending the last two years with the Braves. I'm told the deal is part of an earlier transaction. A much better effort from the home side means this series is tied heading back to the Complex. Fernie scored early and often, taking Game 2 by a 5-2 final, thanks in part to a pair of goals from Castlegar product Scott Morisseau. Connor McLaughlin, Luke Richardson and Cale Wright also scored for Fernie, while Spencer Brodt and Tyler Robinson replied for Castlegar, who scored twice whilst short-handed. The Rebels fell victim again to that demon known as the slow start. We saw it several times against Beaver Valley and again tonight, as McLaughlin's goal came 48 seconds in, and Castlegar found themselves down a pair by the three-minute mark. The West Kootenay visitors also took several stick infraction penalties, and were it not for a couple of odd-man breaks when short-handed tonight's game could have had a different complexion. Former Rebel Andrew Walton was also much stronger between the pipes after a so-so performance last night. You can bet he'll be bringing his "A" game back to his home rink. The series now shifts to the Complex for Games 3 and 4 Thursday and Saturday. And after crowds of 600+ for each of the first two games, here's hoping fans in Castlegar can pack the stands to the rafters this weekend. Having earned the split, the Rebels will look to come home with a 2-0 series lead after tonight's Game 2 in Fernie (6:30 Pacific, Memorial Arena). 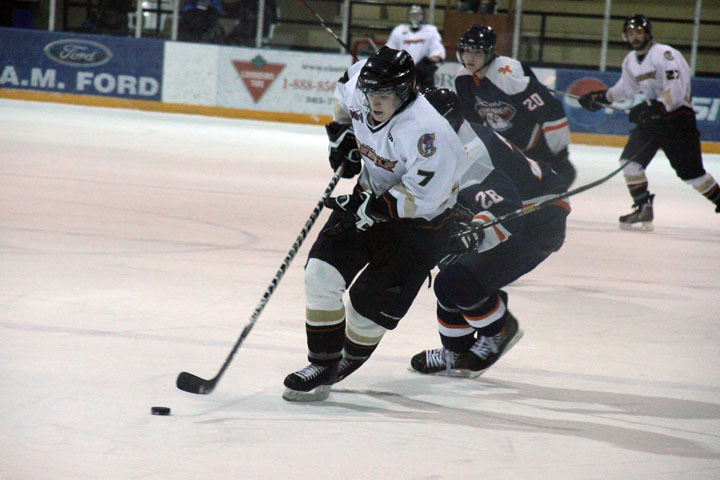 A Taylor Anderson hat-trick helped Castlegar to an 8-4 victory in last night's Game 1. Ryan Aynsley, who scored a spectacular goal in the first period, also had three points while former 'Rider Jamie Vlanich chipped in with two assists. The Rebels will need to weather another storm tonight to make it happen, though. Fernie came out firing yesterday, jumping out to an early 1-0 lead, and their ability to claw back from a 4-1 second period deficit proves these Ghostriders pack a lot of punch in their chaps. The likes of Scott Morisseau, Cale Wright and Luke Richardson will be counted on even more this evening, as Trail product Thomas Abenante will sit Game 2 out after breaking the KIJHL misconduct rule for a hit from behind on Castlegar's Erik Wentzel (who had an assist in his return to the lineup after missing 4 of the 5 games against Beaver Valley). Broadcast Info: As always, Fernie's crew will have the pay-per-view. My friend and colleague Jon Zacks is in the Elk Valley and will have the call on Mountain FM (and online here). Pre-game show is at 6:15 with the opening faceoff at 6:30. Audio: Jonny caught up with a couple of Rebels following Game One. For Stuart Walton, click here. Out of Town: Osoyoos answered back in the Okanagan Conference final last night, but it took extra time. Former Kimberley Dynamiter Corey Allen scored the winner to lift the Coyotes past Revelstoke 3-2. That series is even at one game apiece heading back to Revelstoke. Trust the captain to lead by example. Taylor Anderson put up a hat-trick, including the game-winner 3:22 into the third period as Castlegar doubled Fernie 8-4 to win Game 1 of the Kootenay Conference final. Ryan Aynsley, Spencer Brodt, Anthony DeLong, Diego Bartlett and Stuart Walton also tallied for Castlegar in a wild game that saw half of the twelve goals come in the final frame. Marty Wicks, Cale Wright, Jeff Zmurchyk and Thomas Abenante replied for the Ghostriders, while (and perhaps cruelly) Fraser Abdallah was assessed the loss despite allowing only two goals. Andrew Walton was given the hook after the 4th Castlegar tally but found himself back in after Bartlett made it 6-4. The Rebels found themselves up 4-1 early in the second, but Fernie stormed back with a pair of tallies (Zmurchyk and Abenante) in the first 1:59 of period 3. From then on, though, it was all Rebels, as Castlegar outshot the hosts 17-5 in the third. Alex Ross made 27 saves, including at least one ten-beller, for his fourth consecutive playoff victory. Fernie will be without Abenante for tomorrow's Game 2 after being assessed an automatic game misconduct for a check from behind late in the game, as he caught Erik Wentzel in a vulnerable position. Radio Land: For those of you who tuned into Mountain FM's coverage tonight, I hope you enjoyed the broadcast. Everything came together at the last minute, but we as a station are proud to be carrying the away games the rest of the way. Up Next: Game 2 goes tomorrow night at 6:30 Pacific. Fasten your seatbelts everyone, it could be a wild ride. Castlegar and Fernie were the two top teams in the KIJHL's Kootenay Conference during the regular season, so it seems almost fitting that it will be Castlegar and Fernie to decide the Kootenay Conference crown. How They Got Here: The Rebels had consecutive five-game series victories over the Spokane Braves and Beaver Valley Nitehawks, while Fernie swept the Kimberley Dynamiters before a 7-game battle with Creston Valley. Coach's Thoughts: I caught up with Rebels bench boss Steve Junker yesterday, click here to hear what he had to say about the upcoming series. Broadcast Info: Fernie's crew will have the webcast at 6:30 Pacific. Mountain FM will be carrying all remaining Rebels away games, including tonight. Jon Zacks has the call tonight and tomorrow beginning at 6:30. To listen online, click here. Brotherly Love? : Not quite sure how I overlooked it Saturday (thanks to whoever left the comment for pointing it out), but yet another side story is the sibling rivalry between Andrew and Stuart Walton. The elder brother was shipped to Fernie for Mike Wiest and Jamie Vlanich at the beginning of December, and by all accounts has lived up to his billing, especially since his running-mate Fraser Abdallah went down to injury. Stuart, meanwhile, had a career year with the Rebels, posting 55 points after only scoring 10 last season in limited action. Our Opponent: Plenty of West Kootenay connections on the high-flying Ghostriders. In addition to Walton and Castlegar's Scott Morisseau (the two-time defending KIJHL scoring champ), Fernie also boasts Trail's Thomas Abenante, as well as imposing defenceman Jeff Zmurchyk (who is a former Smoke Eater), and Arizona product Connor McLaughlin (who is a former Nelson Leaf). Coach Will Verner is a former Rebels bench boss, while forward Luke Richardson also played briefly with Castlegar at the beginning of last season. The Ghostriders are full marks for their 42-5-0-3 regular season record, and several members of their organization have told me they want to enter the Cyclone Taylor Cup (which they're hosting) "through the front door" as KIJHL champs. Out of Town: A surprising result to the Okanagan final last night, Revelstoke waxed Osoyoos 8-2. Bruce Silvera had a hat-trick for the defending champs. Game 2 goes tonight in the desert. Stay tuned to the blog for a full-blown preview tomorrow morning. Johnny Park had the eventual game-winner in Fernie's 3-1 Game 7 victory over the Creston Valley Thunder Cats tonight, as the 'Riders clinched the Eddie Mountain division title. That means Fernie and Castlegar will meet for the Kootenay Conference crown beginning (tentatively) Monday night in the Elk Valley. How can you not love this matchup. Fernie's visit to Castlegar in October (a 4-3 Rebels overtime victory, winner courtesy Taylor Anderson) might just have been the game of the year at the Complex this season, and the return engagement at the Fernie Memorial Arena (a 3-1 Rebels win) was no slouch either. How can you not love the side stories. Andrew Walton and Alex Ross were running mates with Castlegar for more than a year until the blockbuster trade that saw Mike Wiest and Jamie Vlanich come (back) to the West Kootenay on December 1st. Castlegar's Scott Morisseau, the two-time defending KIJHL scoring champ and current league MVP, gets to play against his hometown team. They were at the top of their divisions when the regular season ended just under a month ago. They are at the top of their divisions now. Just like last round, this promises to be a heck of a best-of-seven, I know I can't wait. I caught up with a couple of Rebels after the Game 5 clincher against Beaver Valley. For goaltender Alex Ross, click here. For defenseman Aaron Brewer, click here. Castlegar will find out who they'll face in the Kootenay Conference final tonight, as Creston Valley and Fernie get set to play a deciding Game Seven at the Fernie Memorial Arena (6:30 PT, webcast available on kijhl.ca). If Fernie wins tonight, the Rebels will open Round Three on the road (and set up a tantalizing matchup against former Rebel Andrew Walton and Castlegar product Scott Morisseau). If Creston Valley wins, the Rebels will start at home against a team that has given highly-touted Fernie fits over the first 6 games of the Eddie Mountain final. The Kootenay Conference final is (tentatively) slated to begin Monday (no matter where Game One is played), the Okanagan final between Revelstoke and Osoyoos opens up tomorrow night in the desert. If you haven't had a chance yet, check out the Game 5 gallery put up by Castlegar News editor Robson Fletcher earlier this week on the newspaper's Facebook page. Access it by clicking here. Off to Round Three, though it wasn't easy. Aaron Brewer's power-play goal late in the second period proved to be the game-winner as The Rebels won 4-2 to take the Neil Murdoch division final in 5 games. Spencer Brodt, Ryan Aynsley and Anthony DeLong also scored for Castlegar, who again found themselves behind in the first minute after Colton Donselaar put the visitors ahead. Ryon Sookro also tallied for BV, who could not fool Rebels goaltender Alex Ross in a third period that had all 578 fans in the Complex on the edge of their seats. Ross, who had arguably his strongest game of the post-season, was unstoppable, including a robbery of Sookro that moments later turned into a DeLong breakaway insurance marker. As in Game Four, special teams again played a role in the decision. Castlegar scored three times on the power-play (DeLong's goal being the only even-strength marker), while Beaver Valley tallied on only one of their five power-plays. Full marks to Beaver Valley for an exciting series; other than Game One every tilt in this year's Neil Murdoch division final was well within reach for either club. The 'Hawks will be back in force next year, their squad had only one overage player (Donselaar) and you can bet this year's playoff run will only make their returning players hungry in 2011-12. Up Next: Good question. Fernie leads the Creston Valley Thunder Cats 3-2 after a 3-1 Game Five victory tonight. Should the Ghostriders win in 6, I'm told Round Three will start Sunday at the Fernie Memorial Arena, though that (as well as the venue if Creston comes back) could easily change. Tip of the Hat: to graduating Nitehawk Colton Donselaar. He was a force throughout the series on a top line with Sookro and Chris Derochie, and entertained KIJHL fans just as much as he antagonized KIJHL opponents over the past four years in the league. All the best to you Colton in whatever avenues your hockey career and personal journey take you. Players of the Month: Castlegar product Scott Morisseau of the Fernie Ghostriders is the Kootenay Conference Player of the Month for February. The accolades just keep rolling in for the two-time KIJHL scoring champ, who was also named the league MVP last week. Jordan Wood of the Kelowna Chiefs is the Okanagan Conference recipient, while defenceman Darren Tarasoff was the Rebels' nominee. It's do or die time for Beaver Valley. After the Rebels took 2 of 2 from the Hawks in Fruitvale Monday and Tuesday night, the series shifts back to Castlegar tonight (7:30, Complex). With a win, the Rebels can move on to Round 3 against either Fernie or Creston Valley. Again, a relatively small gameday package, because situationally not much has changed for Castlegar since Game 4. I'd expect Alex Ross to again get the nod between the pipes tonight, but it's anybody's guess who will start for Beaver Valley, after Zach Perehudoff was named the starter for Game 4 over Mike Vlanich. For Erik Alden, click here. For Ryan Aynsley, click here. Broadcast Info: Once again, we'll have the webcast for you beginning at 7:30. Upcoming Schedule: If Beaver Valley wins tonight, Game 6 will be tomorrow in Fruitvale at 7:30. A Game 7 would be back at the Complex Saturday night (7:30) with Round Three slated to start either Sunday or Monday. Out of Town: The Okanagan Conference final is set. After Osoyoos eliminated Kelowna two days ago, the Revelstoke Grizzlies booked their ticket last night after taking out former Rebel Dylan Richardson's Kamloops Storm in five games. One win away from Round Three after the most defensively responsible game (by both teams) of the series. Jesse Knowler's deflection late in the second period was not only the only Castlegar goal not scored on the power-play, it was also the game-winner, as Castlegar escaped the Hawks Nest with another hard-earned victory. Ryan Aynsley, Stuart Walton and Taylor Anderson also scored for Castlegar, who again gave up the first goal in the first minute (for the second time in the series) when Tyler Collins lifted a puck past Alex Ross, who collected his second straight victory in the closest rink to his home town of Montrose. Ryon Sookro, who earlier in the day was named the KIJHL's Most Sportsmanlike Player, scored twice for BV. 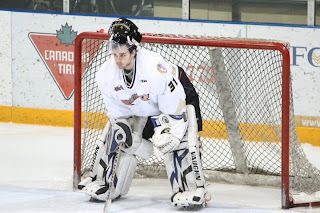 Zach Perehudoff was strong between the pipes in his first KIJHL playoff start, as he took over for Mike Vlanich. Castlegar's penalty-killing was the difference, as the Nitehawks went 1/10 on the power-play (Sookro's second goal late in the third period was the only special teams marker for the home side). The home side failed to capitalize on 3 two-man advantages in a game that saw plenty of penalties dished out (Castlegar went 3/7). Up Next: Game Five goes Thursday night at the Complex (a 7:30 PM start). Hope to see you at the rink (and if not, hope to have you aboard for the webcast)! Out of Town: Creston Valley isn't going away. Despite being outshot 41-29 they defeated Fernie 2-1 on home ice tonight to even the Eddie Mountain division final at 2-2. Osoyoos eliminated the Kelowna Chiefs in four straight with a 5-0 win in Rutland tonight. Kyle Laslo, who today was named the league's top goaltender, made 19 saves for the shutout. A short gameday package today, as the Rebels again head south to Fruitvale for a pivotal Game 4. A win tonight would give Castlegar the chance to clinch the series at home on Thursday, while a Nitehawk victory would secure another home date at the Hawks Nest and for them, breathe new life into the series. I'll be interested to see if the Rebels dress seven defensemen again this evening. To me it seemed like Jamie Vlanich played about 35 minutes in Game 3, but he was full marks. The line of Vlanich, Taylor Anderson and Jesse Knowler was buzzing all night, and coach Steve Junker must have been happy with another night of balanced scoring that included a two-goal performance from Aaron Brewer. For the most part, the line of Colton Donselaar, Ryon Sookro and Chris Derochie was contained yesterday after they ran roughshod over the Rebels in Game 2. Dallas Calvin seems to be improving as the series goes on: the 16 year-old is tied atop the 'Hawks leaderboard (with Derochie) with 15 points. Another storyline to watch is the goaltending. Castlegar rebounded nicely from a shaky first period, while Mike Vlanich had I thought his best game of the series despite allowing six goals for a second consecutive game. Whichever team is able to buckle down defensively and prevent the scoring outbursts we've seen in each game so far will be at a huge advantage. Broadcast Info: Once again, the Nitehawks crew will have the call at 7 PM, then join us for Game 5 from the Complex Thursday. Out of Town: Osoyoos can move on to the next round with a victory in Kelowna tonight. The Coyotes lead the Chiefs 3-0 in the series, while Fernie can with a win take a 3-1 stranglehold home against a plucky Creston Valley squad tonight. 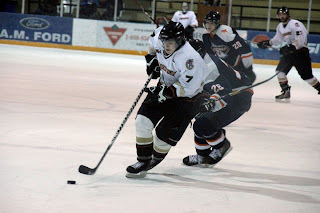 Former Nelson Leaf Dustin Johnson had two goals in his return to the BCHL's Victoria Grizzlies last night. A quick look back while things already move forward.